I will tell you that– from the beginning– I was afraid to go to Africa. I can’t say why, exactly. It was the “unknown” thing, I’m sure. The fear was eased, somewhat, because of my parents’ experience: they have been to Africa many times, although their travel is entirely west and South Africa– not east Africa, not Kenya. Still, it helped to know that they’d been there– and back again– many times. And it helped, too, that many, many people thought our going and taking the children with us was a Really Excellent Idea. Bill and I knew it would be good to go to Kenya, to witness how the Church is working there, to see with our own eyes what living in poverty or with AIDS means, to begin to understand what God is doing there. We wanted the children to see it, too. But I still felt afraid. What didn’t help were the few– the Very Few– who raised questions. No one said outright that we shouldn’t do it, but a handful– a Well-Meaning Handful– wondered aloud if we were sure that this was the thing we ought to do. Sure? Yes. We were sure. We thought we were sure, anyway. Funny, isn’t it? how among twenty or thirty positive and encouraging voices, the one or two or three discouraging ones can sound So Loud? I had seen Hotel Rwanda, and wasn’t that enough? One can read all the political reports one can find about the social or political situation in another country. It can seem safe as safe anywhere. But who’s to say, on any given day, that Something Bad won’t happen? About two weeks before we left, we read a report of ten beheadings just outside of Nairobi. One Sunday I asked Keith point blank about it. He’d been on this trip two years before and taken two of his four sons with him. But his sons were older than ours at the time of their trip, and he hadn’t taken a six-year-old with him. No one from our church had ever taken a six-year-old. “It’s safe, isn’t it, Keith?” I said, believing that I would have his reassurance. He and his boys had, after all, returned home safely. I found this Immensely Comforting, although I realized, of course, that there was no promise in there Anywhere for physical safety– my children’s, my husband’s, my own. I would like to think that God will protect my children from injury and pain of every kind, but He didn’t do that for His own Son, so I’m guessing that I can’t exactly expect it for me. Of all the people I’ve ever met, Charleen and her mother Nancy were perhaps the most marginalized. Nancy’s AIDS had progressed to the point that she was extremely weak; her husband kicked her and her daughter Charleen out of the house because Nancy was “useless” to him. When we met this thirty-something woman and her daughter, they had sought refuge with Nancy’s sister. Now the household in Kware slum swelled to seven persons, all living in a ten-by-ten foot house. I had noticed, too, that Nancy’s ankles may have been, at most, two inches in diameter. We tried to call on Nancy and Charleen again a few days later. 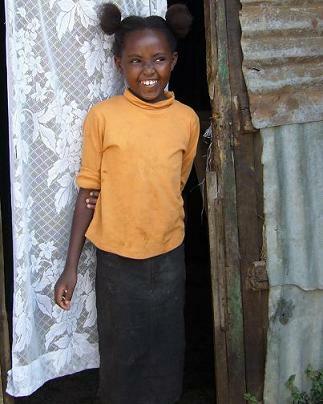 We wanted to tell them that, through Beacon of Hope, we would sponsor Charleen. This would ensure her food, clothing, and education. And Charleen would not become a street child. We were disappointed to learn that Nancy and Charleen were not at home. On our last day at Beacon of Hope, I looked up and was surprised to see Nancy and Charleen standing in the hallway. Nancy told me that her sister had kicked them out of the house a few days before, and that she and her daughter had relied on the kindness of other “mommas” in Kware for safe places to sleep. They had come to Beacon in the hopes of finding help. We didn’t go to Kenya to be heroes. We honestly went to learn. But that day we were given the opportunity to make all the difference in the world to Nancy and her daughter: we were able to pay for them to find a home so that they could both be enrolled in Beacon of Hope’s program. Before we left Africa, Nancy and Charleen had a small house of their own, and Charleen would be returning to school in September. We could safely assure Nancy that Charleen wouldn’t become a street-child. On July 5th, Nancy died of AIDS. Charleen’s extended family has rejected her, and for now she is living with a woman from Beacon of Hope, to whom Nancy signed over custody before she died. But the question has been coming to us again and again since then: what can we do for Charleen, for this little orphan girl? 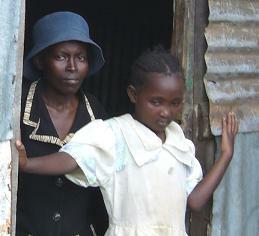 She is living in a slum with a woman who must care for two other children besides. What is the extent of our responsibility? What is the best thing for Charleen? This time the worries come of their own accord, without any well-meant words of warning from others: She’s older than two of my three children; she’s black; she’s Kenyan; she’s grieving; her English is weak; you just don’t know what you’re getting when you adopt. But you don’t know either, do you?, what you’re getting when you birth a child. And every child has the potential to break her mother’s heart. So now we are really and truly thinking about and talking about and praying about adopting Charleen. We are waiting to hear from people at Beacon of Hope, too, because we don’t want to be practicing any kind of heroics. We don’t think we can save Charleen’s life. We don’t have delusions of grandeur. We just know that we have room for Charleen, and that we can love Charleen, and that we do love Charleen already. Yes, we are sure about that. And despite all the questions in our heads, despite all the unknowns, despite the problems and potential problems this will inevitably create, we know that We Are Safe. song lyrics “White Dove,” from the record The Morning by Andrew Osenga. article quotes from an interview with the Rt. Rev. Dr. David Zac Niringiye in Christianity Today. Thank you for going to Africa Rebecca. Thank you for taking your whole family. And thank you for loving Charleen. And of course thank you for posting about all of it. wow. you all will definitely be in our prayers. and it was moving to see andy’s lyrics in that context. charleen’s beautiful! I am praying for you, dear friend, for wisdom and direction. I praise God for you and for your deep love. This was definitely worth the wait! Thanks, Rebecca.